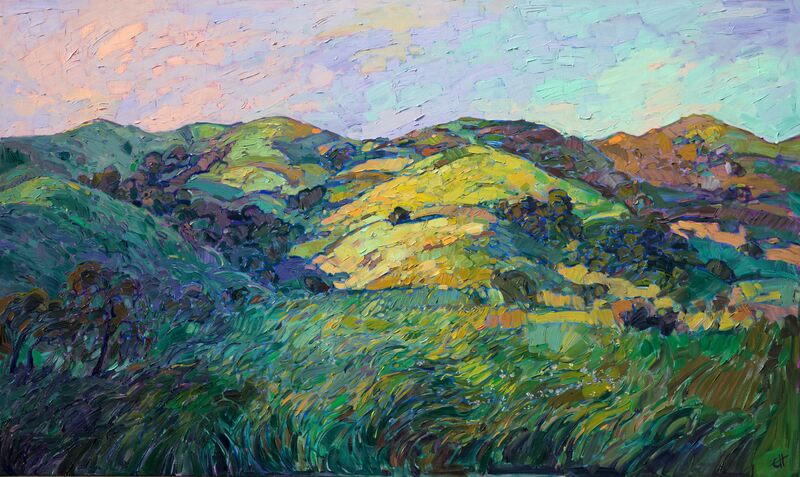 "Paso Robles, California Studio On the Park had a spectacular display of color this fall with Southern California artist Erin Hanson’s PasoScapes. 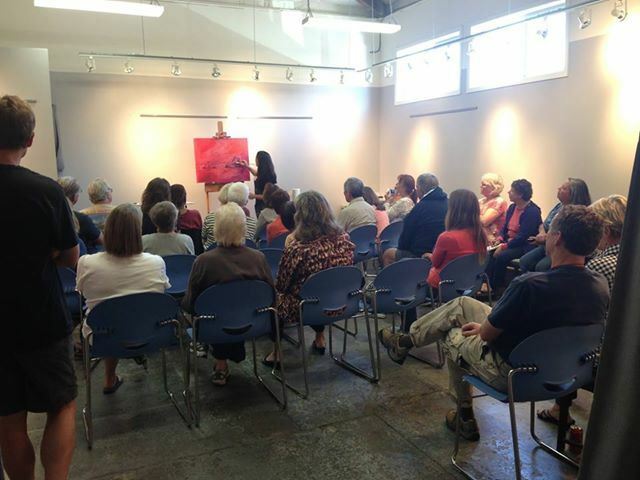 Erin gave a special demo of her “Open Impressionist” style the weekend of October 26 & 27. I sat enthralled while she engaged us in her process. "I’m drawn into her expression of light and shadow — her colors are pure and primary, void of black, vibrant and vibrating. 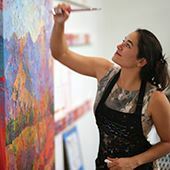 Alizarin red, Pthalo blue, Ultramarine, Cadmium yellow light and buckets of Permalba white provides the base for her impasto style — these are the colors that construct her painting. Her compositions are mapped on her palette. As she demos, she outlines the viewing planes and mixes for the 'back-back' the 'mid-back' 'the mid-mid' and the front in terms of color values all the while furiously blending her paint with a palette knife. This mapping of color frees her mind while she’s painting. The actual painting is quite quick, as the planning is mostly complete and the composition solidified in her mind. 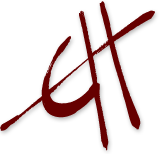 "Our group is huddled together, about twenty-five of us, as Erin shares her now 10-years of painting tips. Her work recalls post-impressionist colorists like Van Gogh and Sandzen — electric color that pulls the eye into the canvas to explore her cobalt blue shadows and bold stroke work. As we watch her complete her color mixing the canvas awaits on the easel. She has a thin wash of magenta, Alizarin red and a bit of Cadmium yellow light as her under-painting. This color will come through in places and serve as a network of lines that reveal what Erin calls a 'mosaic approach,' to paint the details and negative spaces that form the shape of her subject, define the linear planes, and bring cohesiveness to the composition. In hand she has two photos for her inspiration: a horizontal bank of distant mountains with rolling hills and scattered green copses and a singular eucalyptus that will serve as her main character. She quickly divides her canvas into thirds, vertically and then horizontally. This creates a loose grid to organize her composition. Briskly, with a brush dabbed with a bit of Ultramarine, she sketches out her idea, developing balance and movement all the while thinking about how the colors she just mixed will work in her composition. Then the painting begins, we watch her ideas materialize — the artist in action, coaxing the color, creating a path for the eye to travel, her mind’s eye transposed to the canvas. It’s a wonder to behold. "Thank you Erin Hanson for sharing your gift to the world.